To Cite: Noorbakhsh S, Zarabi V, Shamshiri A R, Tabatabaei A. Mycoplasma pneumonia in Cerebrospinal Fluids of Febrile Children With Neurologic Manifestations: A Cross Sectional Study, Tehran, Iran, Jundishapur J Microbiol. 2013 ; 6(9):e7523. doi: 10.5812/jjm.7523. Objectives: To determine the role of M. pneumonia (using PCR and serologically test) in Cerebro Spinal Fluid (CSF) in febrile children with neurologic manifestations (in comparison with normal CSF). Materials and Methods: This cross sectional study was done in pediatric wards of Rasoul hospital in Tehran between 2008 - 2010 upon 55 febrile cases with neurological signs and 10 controls with normal CSF (simple febrile seizure). The CSF samples tested for M. pneumonia DNA (PCR); and Immune Globulin G (IgG) level. Chi square values < 0.05 were considered statistically significant. Results: Positive PCR found in 1 case with Guillan Barre syndrome (1/53; 2%) and none of controls; IgG-CSF level (Cut off 0.0025) had significant difference between cases and controls (Kappa = 0.27, P Value = 0.000). The lowest and highest IgG level observed in aseptic meningitis, and convulsive cases respectively. 73% sensitivity; 90% specificity; 100% Variance (PPV); 28.8% Net Present Value (NPV) determined for IgG-CSF test. Conclusions: Even, very low amount of CSF-IgG with good specificity (90%); could differentiate cases and controls (P = 0.000). The CSF-IgG test (sensitivity 70%, NPV 28.8%) was weak for ruling out the M. pneumonia in cases. positive PCR was rare (2%) in CSF of cases and controls but is more reliable for diagnosing the recent M. pneumonia infection. We prefer to assay the CSF for both serology and PCR in highly suspicious cases. Anti-microbial or immune modulating therapies had possible benefits. Mycoplasma pneumonia is a common cause of typical pneumonia in children and young adults (1). Extra pulmonary manifestations, with or without respiratory involvement reported (2). Cardiac involvement; hematologic, skin, renal, gastro-intestinal, osteo-articular, neurologic, and other manifestations have also been reported in literature. CNS involvement is probably the most common site of involvement in addition to the respiratory system in childhood. The clinical spectrum of M. pneumonia CNS diseases had a wide range. Encephalitis and meningoencephalitis are the most frequent neurological complications, but cases of optic neuritis, transverse myelitis, Guillain-Barré syndrome (GBS), etc. had reported. The exposure to M. pneumonia could have been a few months earlier (2, 3). The pathogenesis of CNS complications is not completely known and the treatment remains partly controversial (2). Direct invasion, neurotoxin production, or an immune-mediated mechanism has been proposed (3-7). The incidence of CNS complications to M. pneumonia infection increased during last decade. Up to 7% of patients with M. pneumonia may have CNS symptoms (8, 9). False positive and negative IgG antibodies in the serum are widely described and at this point it cannot be used to rule in or out for the lack of sensitivity and specificity (1-7) Polymerase chain reaction are available for definite diagnosis of M. pneumonia infection. The positive PCR in the serum and CSF are reliable for diagnosing the recent infection (10-14). M. pneumonia (DNA-PCR) was the most common agent implicated in unexplained encephalitis in the California Encephalitis Project (14). Many studies recommend various anti-microbial or immune modulating therapies in treating CNS manifestations of M. pneumonia (15-21). Neurological manifestations (e.g. encephalitis, aseptic meningitis, focal neurologic signs) are very common in admitted children in our country. Herpes simplex (HSV), Cytomegalovirus (CMV), Mumps, etc. infections reported in febrile children accompanied with neurologic signs (22-27). All the young Iranian population, potentially are susceptible for M. pneumonia respiratory infections and at risk for neurologic complications (15-18). The main goal of this study was to determine the role of M. pneumonia (PCR and serologically) in CSF of febrile children with neurologic manifestations and normal CSF. A cross sectional study was done in Pediatric wards at Rasoul hospital in Tehran, Iran between 2008 –2010. This study was approved by the Ethical Committee in the Research Center of Pediatric Infectious Diseases, Tehran University of Medical Sciences on 55 cases and 10 Controls (normal CSF). Consent letter obtained from cases and controls. Initially a questionnaire was completed by an authorized physician, (e.g. Age, gender, analysis of CSF samples, etc. ), followed by complete clinical examinations. Neurologic findings, imaging changes (CT scan/or MRI), final diagnosis issued. Neorologists observed CT scan and/or MRI and revealed results. 2 pediatricians did classification of disease according to neurologic signs and CSF changes (4). Children with proven simple febrile seizure (normal CSF). Normal Glucose, normal protein, WBC≤ 5 and negative tests for bacteria. Out of 122 febrile ill children, 55 febrile cases with acute onset of neurological manifestations selected after complete studies for excluding all confirmed causes of noninfectious or bacterial meningitis; known infectious etiologies (except M. pneumonia) as the exclusion criteria described below. Febrile cases with acute onset of neurological presentation (e.g. meningo encephalitis, encephalitis, aseptic meningitis; GBS; focal neurologic signs: optic neuritis, transverse myelitis, deafness, cerebellar ataxia) +/-CT or MRI changes +/abnormal CSF finding (4). At least 10 white blood cells/mm with mononuclear cell predominance; the absence of bacterial growth on culture/or negative universal bacterial PCR in the CSF, negative Latex particle agglutination/negative Gram stain for bacteria in CSF. All confirmed cases with other noninfectious (tumor, vascular disease, ADEM); or known infectious etiologies (except M. pneumonia): bacterial meningitis, viral meningitis; Measles, VZV, Mumps. Initially, CSF samples were examined microscopically for biochemical, total WBC and differential. Gram stain was performed on all CSF samples. After centrifugation, deposits were cultured on sheep blood agar, incubated in a candle jar at 37°C for 48 h, followed and sub cultured as standard techniques (1, 2). The BACTEC Ped Plus medium (Becton Dickenson, USA) and automated system was used (Bio Merieux, France), isolates were identified using standard techniques (1). Latex agglutination tests was done using the BD Directigen; Meningitis Combo Test (Becton Dickinson, USA). A Universal PCR assay for detection of Nisseria meningitides, Haemophilus influenza and Streptococcus pneumonia used only on CSF samples suggesting negative bacterial meningitis with other tests (Culture, Gram stain, LPA) (1). 0.5-3 mL of CSF was collected and stored at 70°C. CSF-M. Pneumonia antibody (IgG) level determined by using the ELISA kits (Medical-diagnostic, Germany, Hamburg) in 55 cases. Results were interpreted as suggested by the manufacturer. DNA extracted (Roche; Germany); and M. pneumonia-DNA searched in 53 CSF samples; (PCR- ELISA kits Roche, Germany). Quantitative variables were summarized as mean ± standard deviation (SD) and qualitative variables as count with percentage. Comparison between qualitative variable and test results was assessed by chi-square test (or Fisher exact test if proper). Chi square values (CI 95 %, P < 0.05) were considered statistically significant. 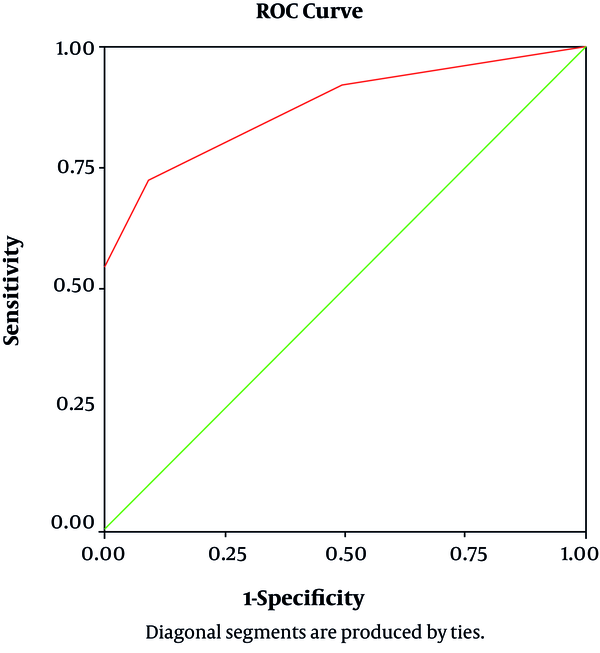 The concordance percentage between CSF-IgG level and variables reported as actual agreement and the degree of agreement was reported as Cohen's kappa (κ) statistics (κ > 0.75, excellent agreement, κ < 0.4, poor agreement and κ between 0.4 and 0.75, fair to good agreement). A ROC curve was constructed to illustrate various cut-offs of CSF-IgG levels in differentiating between the presence and absence of neurologic manifestations. Statistical calculation was performed with SPSS statistical software (version 13; SPSS Inc.). 10 control samples were (simple febrile seizure) studied. 60% male; 40% female; aged between 10 months - 8 years, mean age = 1 ± 2.43 years. CSF samples obtained in winter (50%, 5/10); autumn (30%, 3/10); spring (10%, 1/10); summer (10%, 1/10). Out of 122 febrile ill children, 55 febrile cases with acute onset of neurological manifestations studied. 67% of cases were male; 33% female; cases aged between 5 month to 13 years, mean age = 3.84 ± 3.43 years (Figure 1). 20% (10/55) of samples obtained in spring (23%; 12/55); summer (32%; 17/55); autumn and winter (25%; 13/55). Convulsion (65%; 28/55) was the most common neurologic manifestation; loss of consciousness (33.3%; 17/55); aseptic meningitis (without encephalitis) reported in 17.6% (9/55); focal neurologic signs 13.5% (7/55): GBS: 3; optic neuritis: 1; transverse myelitis: 1; deafness: 1, cerebellar ataxia: 1. Positive PCR obtained from none of controls and 2% of cases (1/53; missed = 2), a 5 years old boy with GBS. Positive CSF-IgG detected in 30/55 (84.6%) cases and 0/10 in control. CSF-IgG level was higher in cases [0.08 ± 0.26 versus 0.001 ± 0.001; P value: 0.02] with poor agreement (Kappa = 0.27) between 2 groups (Table 1). Area Under the Curve (AUC) for CSF-IgG was 0.876 (%95 CI, 0.78–0.96, P Value = 0.000) (Figure 2). CSF-IgG level detected consequently: in convulsive cases (0.97 ± 0.28); GBS (0.21 ± 0.47), and other focal neurologic cases (0.18 ± 0.47). Highest IgG level determined in cases with convulsion and focal neurologic manifestation (GBS; optic neuritis; transverse myelitis, deafness, etc. 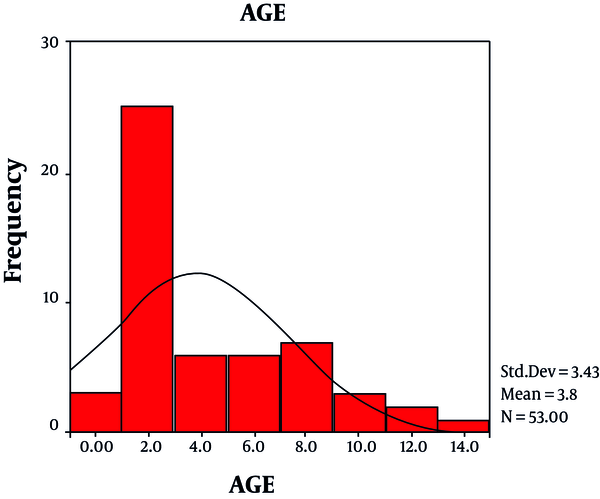 ); and lowest level seen in aseptic meningitis with significant difference between cases with and without aseptic meningitis (0.0067 ± 0.005 VS 0.97 ± 0.28; P value = 0.03). Except for aseptic meningitis, CSF-IgG level was not related to neurologic presentation in cases. Sensitivity, specificity, PPV, NPV of CSF-IgG antibody test (cut off 0.0025) was 73%; 90%; 100%; 28.8% respectively (Table 2). Positive PCR had obtained in 2% (1/53; missed = 2) of studied cases, a 5 years old boy diagnosed as GBS. CSF-IgG level had 73% sensitivity and 90% specificity for differentiating the cases from controls (normal CSF). Presence of very low amount of M. pneumonia-IgG in CSF (0.0025) could indicate M. pneumonia neurologic manifestations. 100% PPV for IgG-CSF level was good for diagnosis but 28.8% NPV was weak for ruling out the infection. In the state with high suspicion, PCR testing in serum or CSF might be helpful. Here, CSF-IgG (0.97 ± 0.28) were high in convulsive cases. Cases with encephalitis, GBS and focal neurologic signs (optic neuritis, etc.) had higher level of CSF-IgG antibodies (P = 0.1; 0.9). M. pneumonia had not a prominent role in aseptic meningitis but probably a strong role in other cases (encephalitis, GBS and focal neurologic signs). Minimum CSF-IgG level was observed in cases with aseptic meningitis without encephalitis (P value: 0.03). Many studies defined the convulsion as common presentation sign in M .pneumonia induced encephalitis (1-5). Similar to the present study, optic neuritis and encephalitis (but not aseptic meningitis) were common in at least three other studies (8, 11, 13). Suzuki et al. reported GBS as a common presentation after M. pneumonia infection (10). Results of present study is very close to 2% positive PCR reported by Christie et al. (14) and Candler et al. (3 cases:1 encephalopathy;1 seizures;1 optic neuritis) (11). In oppose to Gloria et al. (9) we did not find any role for M. pneumonia in aseptic meningitis (serologic and PCR assay). Trollier et al. defined the higher incidence (8.3%) of M. pneumonia meningoencephalitis during outbreaks (13). M. pneumonia was the most common agent implicated in unexplained encephalitis in the California Encephalitis Project (14) M. pneumonia associated encephalitis had fewer seizures in compare with other causes (14). In all above studies positive CSF IgG in spite of negative PCR test reported. It might indicates that most neurologic complication of M. pneumonia (especially optic neuritis and encephalitis) are due to Para-infectious immune-mediated process or cytokine production in CSF rather than direct invasion by the microorganism (7). There are major problems in diagnosis. How to interpret the presence of an IgG or IgM, or DNA (PCR) in CSF? Is the presence of IgG in CSF just the product of the increased permeability of the blood brain barrier? Does it means an acute process or the presence of a past infection or just exposure to M. pneumonia? The exposure to M. pneumonia could occur a few months earlier. A false positive and false negative of IgG antibodies in the serum is widely described and at this point it cannot be used to rule in or out for the lack of sensitivity and specificity. The presence of IgG in serum does not imply causation but might have more value in CSF (6, 7) the positive PCR in the serum and CSF are more reliable in diagnosing the recent infection (6, 7). In Iran, before extensive use of the mumps vaccine in immunization program mumps was considered as one of the prevalent and important causes of pediatric meningoencephalitis (250/100,000) (24). Other viral causes; Herpes simplex type-1 and cytomegalovirus reported 7% and 1.5%, respectively (25-27). M. pneumonia infection may presents as asymptomatic, upper or lower respiratory infection (1). Most infection happens after 4th year of life in Iranian children (10-12). Up to 18 million young populations living in Iran, which are susceptible for M. pneumonia infection (respiratory and neurologic). It is expected that the yearly incidence of CNS diseases due to M. pneumonia would be much higher in developed countries. Neurologic complications might needs hospitalization for diagnosis; decreasing their symptoms or specific treatment. Pediatrician should be aware of the potential association between symptomatic M. pneumonia respiratory tract infection and several neurologic complications (e.g. convulsion, encephalitis, GBS, optic neuritis) but not aseptic meningitis. Although the positive PCR in CSF are very useful in cases, are insufficient .We prefer to test CSF from both serological and PCR aspect in highly suspicious cases (18). Anti-microbial or immune modulating therapies (Corticosteroids, intravenous immunoglobulin) had possible benefits in treating such complications (19-21). Even, very low amount of CSF-IgG with good specificity (90%); could differentiate cases and controls (P value = 0.000). The CSF-IgG test (sensitivity 70%, NPV 28.8%) was weak for ruling out the M. pneumonia in cases. Positive PCR was rare (2%) in CSF cases and controls but is more reliable for diagnosing the recent M. pneumonia infection. We prefer to assay the CSF for both serology and PCR in highly suspicious cases. Anti-microbial or immune modulating therapies had possible benefits. This study was supported by the Research Center of Pediatric Infectious Diseases, Tehran University of Medical Sciences. Implication for health policy/practice/research/medical education: Mycoplasma pneumoniae is a common cause of atypical pneumonia in children and young adults. CNS involvement is probably the most common site of involvement in addition to the respiratory system in childhood. The clinical spectrum of M. pneumoniae CNS involvement had a wide range. Authors’ Contribution: Samileh Noorbakhsh: Study concept and design, interviews and clinical examinations and Completing the Questionnaire. Vida Zarabi: Primary clinical exams, primary interviews and filling the standards. Ahmad Reza Shamshiri: statistical analysis, edition and preparing the article. Azardokht Tabatabaei: Clinical study and interpretation of laboratory studies. Financial Disclosure: Samileh Noorbakhsh, Vida Zarabi, Ahmad Reza Shamshiri and Azardokht Tabatabaei Confirmed that they don’t have any relevant financial interests or financial conflicts within the past five years and for the foreseeable future. They have no financial interests related to the materials in the manuscript. Funding/Support: This study was supported by Research center of pediatric infectious disease (Tehran University of Medical Sciences).